Corporate renewable Power Purchase Agreements (PPAs) are the next big thing in the energy sector. Allowing corporates and industrial consumers to secure a supply of green electricity at a competitive price, they have the potential to deliver massive reductions of CO2. PPAs have numerous economic benefits for wind energy generators and the wider industry. They facilitate investment for utility-scale projects and thus help to bring new and additional renewable capacity online. And they provide projects with a stable revenue stream. Large energy consumers such as chemical and aluminium producers, ICT, food & drink companies gathered in Brussels today with renewable energy producers for the RE-Source 2017 event to explore how to unlock this potential. The PPA market is expected to grow significantly in Europe. The volume of PPAs almost tripled in Europe in 2016 compared to the year before, with over 1 GW of capacity contracted. Of the 1.5GW of corporate PPA deals signed over the past four years, 1.3 GW of that was from wind energy. PPAs enable large energy consumers in the IT, chemicals or heavy industries to secure a supply of green electricity at a competitive price. They also provide financial certainty for renewable energy providers and are therefore increasingly relevant as renewables become exposed to market dynamics. “Clean energy is getting really, really cheap on a levelised basis. Corporates, you can lower your costs by buying renewable electricity”. This was the message from Michael Liebreich, Founder of the Bloomberg New Energy Finance, in the morning’s roundtable discussion for buyers and energy suppliers. Household names such as Google are already on board. Their data centre in Eemshaven will be powered exclusively by renewable electricity produced at an Eneco wind farm in Delfzijl, the Netherlands. Google is not the only tech firm on board: this week, Microsoft announced a 15-year PPA with GE for all the electricity generated by the 37MW Tullahennel wind farm in county Kerry, Ireland. Meanwhile, BT this year signed a PPA with a Scottish wind farm that will provide the British telecoms operator with 100GWh of clean electricity per year. It’s not just tech or telco firms that are going green either: last year, food giant Nestlé signed a 15-year PPA with developer Community WindPower. The nine-turbine farm in Scotland will provide half of Nestlé’s power needs in the UK and Ireland. The 30 MW wind farm powers 30,000 local homes as well as the equipment that makes a number of Nestlé’s chocolate bars such as Kit Kat. And Unilever, the global consumer goods firm, has become the main purchaser of electricity from a 23-turbine wind farm in Lochluichart, Scotland. 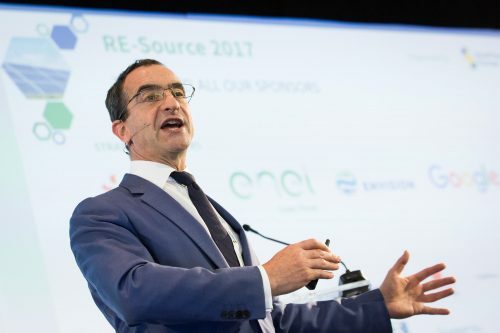 Despite recent growth, PPAs are still an untapped resource in Europe: “We need to be doing this on a pan-European basis to drive costs down,” Liebreich added. Participants discussed how the procurement of renewable energy by corporations can be further facilitated. It’s key to clarify existing legislation in Europe for any legal restrictions related to long-term competitive contracts; to complete the implementation of the Guarantees of Origin tracking system with full disclosure for all technologies to avoid the risk of double-counting; and to provide guidelines and model contracts to create more streamlined processes and open the market to smaller enterprises.